I love the way apricots and briny olives play off each other in this bright cauliflower lentil salad. It keeps well, so it's a great salad to pack for lunch. Well, I’ll be honest – these 4:30 Chicago winter sunsets take some getting used to, so I made this cauliflower lentil salad full of bright colors and flavors to make up for it. 🙂 At least that’s what I tell myself as I seriously consider getting one of those vitamin D lamps. Have any of you ever tried one? Anyway, back to the salad! I was going to save this recipe to post in January. You know, once everyone wants to get healthy and eat vegetables again… but then I realized – you’re all here because you love vegetables, holidays or not!! 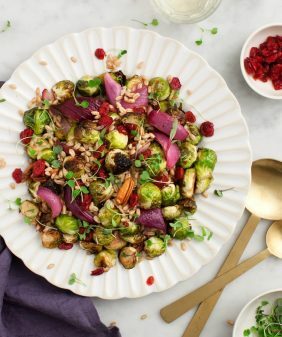 This cauliflower lentil salad doubles as a holiday side dish (I’m bringing it to Christmas dinner) and as an every day veggie meal (I love it for lunch). Seasoned French green lentils: Be sure to use French green lentils here. They have a more al dente texture than brown lentils, which, to me, get too mushy for salads. And because I find plain lentils to be very bland, I season them with lemon, olive oil, Dijon mustard, and a good bit of sea salt and pepper. The recipe below makes quite a bit more lentils than you’ll need for this salad, but I like to make a big batch – they’re handy to keep in the fridge for salads during the week. Also, it’s hard to cook a teeny tiny pot of lentils. 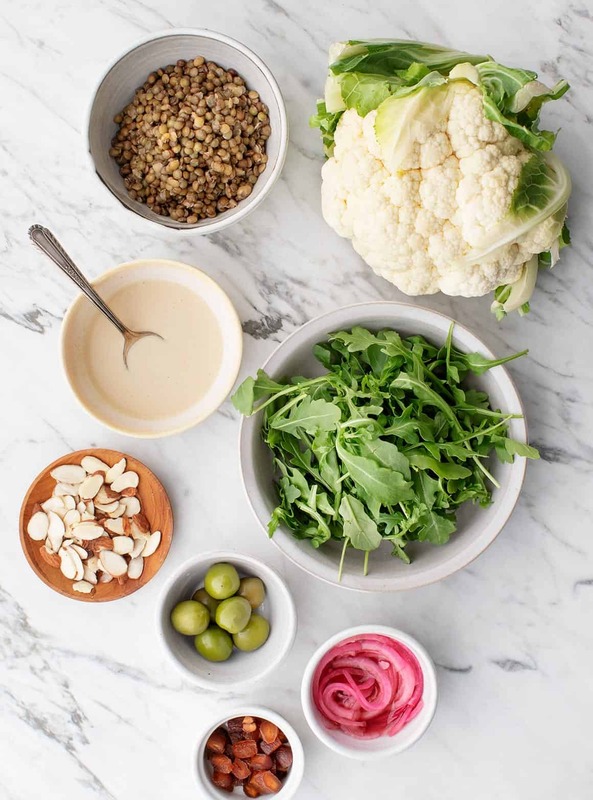 Bright, briny things: Pickled onions and olives (or capers) give a bright pop of flavor that contrasts the nutty roasted cauliflower. For the record, my husband Jack has been giving me a hard time lately for always describing food using the word “pop,” but I can’t think of another way to describe bright, contrasting food, so “pop” it is for now. 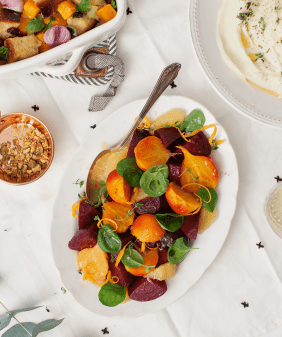 Creamy tahini dressing: Mix together tahini, lemon, olive oil, and sea salt… done. Something crunchy: Pine nuts, sliced almonds, or if you’re nut free: pepitas. Something sweet: Diced, dried apricots or dates round out the nutty/earthy flavors of the cauliflower and lentils. The sweetness also balances the tartness of the bright, briny things. Something green: Peppery arugula, because it is a salad after all. For more salads that I love, have a look at the salads section of our recipe page! 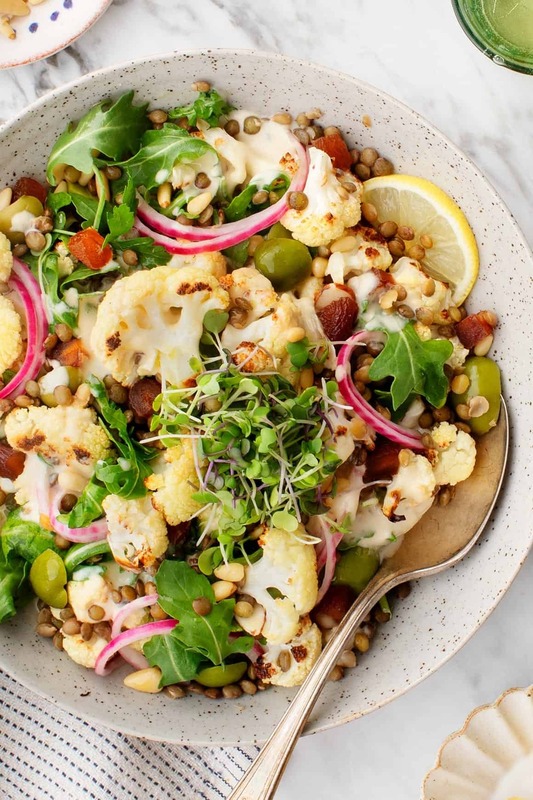 This cauliflower lentil salad is hearty and bright - with pickled onions, arugula, dried apricots and a creamy tahini dressing. Vegan and gluten free. Make the lentils: In a small saucepan, combine the lentils and water and bring to a boil. Cover, reduce the heat, and simmer, stirring occasionally, for 20 minutes or until tender but not mushy. Drain any excess water, let cool, and then transfer to a medium bowl. Stir in the lemon juice, olive oil, salt, mustard, and pepper and set aside. Roast the cauliflower. Preheat the oven to 425°F and line a large baking sheet with parchment paper. 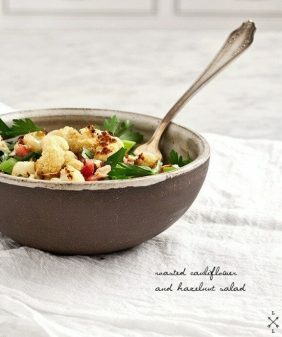 Toss the cauliflower with drizzles of olive oil and pinches of salt and pepper and roast for 20 to 25 minutes, or until browned around the edges. Meanwhile, make the dressing. 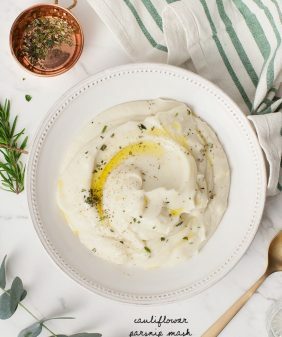 In a small bowl, whisk together the tahini, lemon juice, olive oil, and salt. If necessary, add water, 1 tablespoon at time, to create a drizzleable consistency. 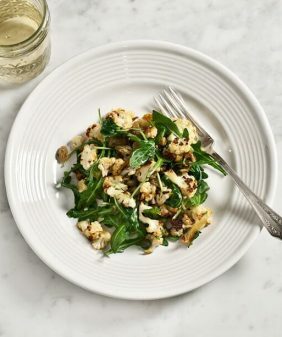 Make the salad: In a medium bowl, toss the arugula and roasted cauliflower with a drizzle with olive oil, a squeeze of lemon, and a pinch of salt. Spread onto a platter and drizzle ⅓ of the tahini sauce on top. Sprinkle on ½ cup of the lentils, the pickled onions, pine nuts, apricots, and olives. Drizzle with the remaining tahini dressing (or as much as you like) and top with microgreens, if using. Season to taste and serve. Tip: Store remaining lentils in the fridge - I like to keep them on hand to add to any quick salad throughout the week. Combine all in a small tight-lidded jar. Add just enough water to cover the onions. Shake, then chill for at least 20 minutes. I’m very excited to make this, it has all the things I love! I’m in Portland, Oregon, where the sun (when it comes out) sets even earlier, and I’ve tried one of those lights, it didn’t do much for me…my favorite thing to cheer up is go in the sauna at the gym! This looks really great. I think I might bring this to Christmas dinner as well. I love the contrasting flavours. I am making this next week for sure! I’ve recently decided to eat more veggie based meals and started browsing your recipes. So far I’ve loved everything I’ve tried and am very impressed. Can’t wait to see how this one tastes too! Hi Katie, I’m so glad you’ve been loving the recipes! I am going to make this for Christmas Eve and am wondering if those are pine nuts on the side? they’re in the salad… I just set some on the side for the photo – they don’t actually have to be served on the side. 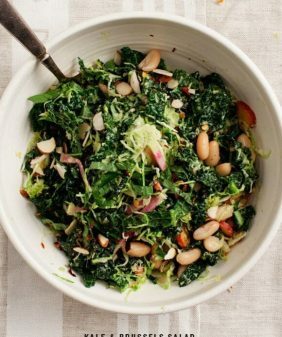 I am so happy to find this blog post, never thought that salad could be this much healthier and delicious. You are awesome. Yumm! The salad looks too good but I think it is missing something. Maybe adding tomato can change the flavour a little bit! What do you suggest Jeanine? This is delicious!! My whole family loved (& they never agree). And the extra lentils were great add ons for the rest of the week. thank you, this is so delicious! I had to improvise a little and used marché lettuce and bits of radicchio, subbed dates for pomegranate seeds, turned out wonderful. Hi Aline, I’m so glad you loved it! I bet it would be delicious with pomegranate seeds! Hi Allison, I’m so glad you both loved it! Made this and had it for lunch – it was perfect! Black olives made it magic! I love adding tahini to all my salads. I love this salad so much! I’m no cook but everytime i make this i get compliments AND i feel great afterwards. thank you for these great recipes! Hi Jacquie, I’m so glad you love this one as much as I do!! Tahini makes salads even better.